One of the Exploits kits that has been in the news lately is the RIG Exploit Kit. Some of the infections seen by the community seem to be part of a campaign called Afraidgate. I had the chance to capture one infection from this campaign. So, I decided to give it a try and write a small write-up about this multistage weaponized malware kit. The following analysis focus is on a drive-by-download campaign observed few days ago. It leverages the RIG Exploit Kit to infect systems and drop a new version of Locky ransomware (Odin). Due to the complex nature of Exploit Kits, in order to perform analyses I use a combination of both dynamic and static analysis techniques. For the dynamic analysis part, I used an enhanced version of the setup described here “Dynamic Malware Analysis with REMnux’. To reach out to the server “monro.nillaraujo.com ” the operating system performs a DNS query in order to finds its IP address. The name server (NS) who is authoritative for the domain gives the DNS response. 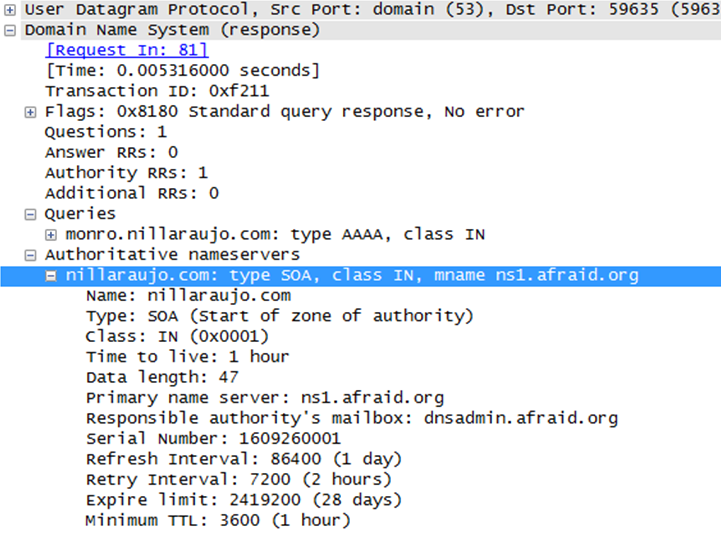 In this case the NS server for this domain is “ns1.afraid.org “. This server belongs to the Free DNS hosting. They provide everyone with free DNS access. In this case the threat actors take advantage of this. I think the name of the Afraidgate campaign might have derived from the fact that the DNS domains used in the gates are being answered by afraid.org. Brad Duncan might be able to answer this! Another interesting fact is that the answer received by the DNS server have a short time to live (TTL). This technique is often leveraged by the threat actors behind the EK because this will make the domain only available for of a limited amount of time, allowing them to shift infrastructure quickly. This makes the blocking and analysis much more difficult. The below figure show the DNS answer for the domain “monro.nillaraujo.com”. The code is quite large so I won’t post it here but in the figure above you could see the last part of it. It contains the Shellcode and the URL plus RC4 key that are used to fetch the malicious payload and decrypt it e.g, Locky ransomware. That’s it for today. In the following post I will cover the malicious Flash file and how to analyze the Shellcode to understand what is done behind the scenes when the exploit is successfully triggered.